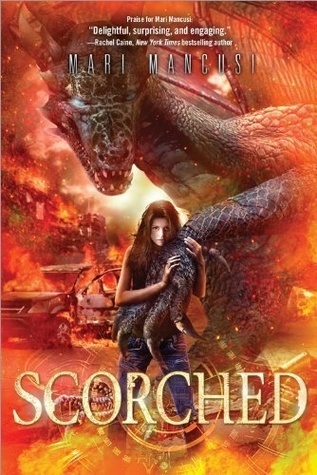 Scorched is about dragons. That's more or less all I needed to know for me to want to read it. Well, not really but the blurb promised a dragon, a mix of sci-fi and time-travel and THAT was all it took for me to add it to my wishlist. Though Scorched is set in the present day, thanks to a few select time-travelers from the future, we get some futuristic technology thrown into the mix, not to mention a few select glimpses of a harsh dystopian world-to-come... burnt by dragon fire. While it wasn't an absolutely perfect read, it was an exciting and quick one, that left me curious about what comes next. Scorched is told in alternating point-of-vue, mainly featuring Trinity or Trin from the present day who unwittingly ends up with a real dragon egg in her possession. Her story is quickly woven in with two twin boys from the future, Connor and Caleb who've travelled back in time, each with diverging missions. Connor was sent back by a team determined to destroy this first dragon egg before dragon fire brings on the 'scorch' that devastated the future. Caleb on the other hand, was sent back by the Dracken, a group hell bent on saving the dragons. Of course being all for animal rights, magical or otherwise, you'd assume that Caleb would be the automatic favorite. But he's kind of a cocky jerk at first. And Connor who wants to kill the dragon instantly comes off more caring and layered. Eventually though, it becomes clear that neither boy is exactly as they seem. Since most of the plot in Scorched takes place in the present day, the world building is minimal. The flashes to the future that we get are purposeful and well explained. They certainly paint a chilling landscape of things to come. Since I do read and watch quite a bit of sci-fi, I felt like the actual timelines or time-continuum were a bit iffy in some places. Like some things we were told about the future didn't add up to the reality of the present day. I am willing to chalk it up to 'wibbly-wobbly, timey-wimey, but unfortunately it wasn't only the time lines that I felt needed further explanation. There was also this thing called The Nether: a shared dragon consciousness where all dragons can visit and continue to live on in after death. Really it was like a whole other world that people can travel too via gemstones. The MC herself asked one of the boys to explain how it was possible and was dismissed. I guess that like her, we had to suspend our disbelief and just go with it. As much as I was fascinated with the entire thing, I was craving more information. I would have needed at least some rules and world-building to satisfy my curiosity. Similarly, telepathic abilities were readily used, with no real explanation as to when this happened. Putting aside my compulsive need for all the details and world-building, I was fascinated by the dragons and their lore. The tentative relationship between humans and dragons is fraught with conflict, but the similarities that are drawn between the two species and their possible coexistence was beautifully done. It was also beyond fresh for me to have dragons in a modern day setting. When I think of dragons, my mind seems to always go towards a medieval setting but the idea of dragons being discovered in modern times was a truly fascinating take on the classic creatures. Despite my few minor issues, I really enjoyed Scorched. The good guys and the bad guys weren't always easy to pinpoint and I like being kept guessing when it comes to people's true motives. The trio of main characters were appealing, the dragons and their history was thrilling and I thought it worked nicely with the sci-fi/time-travel elements. It did kind of bum me out that since both Caleb & Connor were from the future, they (obviously) ended up knowing a lot more about the situation than Trinity did. It always seems to be the way in YA, the girl MC is forced into a dependant relationship with the guy(s) just because they conviniently have all the answers. But other than that, I'm already looking forward to what will become of our heroes and the dragons! Note: I know some that this is a pet-peeve for some readers, but instead of swearing with the usual four letter word we all enjoy, these guys used 'fleck'. It was used quite sparingly, but I thought I ought to mention it nonetheless. I tend to think of dragons in medieval settings, too, so this sounds like an interesting read just to see them outside of that time period. Dragons + time travel also sounds really unique; I think this book would have enough going for it for me to be able to look past a potential love triangle and maybe not having all of the details of the world explained in depth. Thanks for putting it on my radar. :) Oh, and have you read Seraphina by Rachel Hartman? That was an amazing dragon book- with a medieval-ish setting, lol. I've heard some good things about this series. It sounds a bit weak in the storytelling, but I love the idea of the dragon eggs! Dragons books are auto-reads for me but when you throw in time-travel it was impossible to resist ;-) If you can get past a few minor issues in world-building and romance, it's quite fun! Oo this is a very helpful review since I have YET to read this series *sigh*. I definitely still will because DRAGONS and I'm a fan of fantasy mixing with sci-fi. I agree that the trend in YA with the female MC having to depend on the guys is a problem, but fortunately none of these things are huge pet peeves of mine so I should be able to burn through it pretty fast. Are you planning on reading the sequel? I will definitely be reading the sequel Anya! I already have a copy and I'm planning on getting into it soon :D I found that with this one, it was easy to overlook some of the concerns I had, because the book made up for it in other areas! I'm thinking you would too :) Can't wait to see what you think when you do read it! Thanks for the review! I love the cover too! You're welcome Rachel :) I agree, the cover is awesome! Trinity does sound like a character I could like a lot with her snark! She was pretty cool, I can't wait to see how she continues to evolve in Shattered! I've had this one for awhile actually but stilll haven't read it. I like dragons. I like time travel. So I want to try it. Interesting that it's in present time because like you, I tend to think medieval-ish time when I think dragons! Should be interesting when I get to it! Woohoo dragons! Sounds like a pretty good effort (though I love me some good world building too), so I think I'll add this one to my list to read. I really hope the sequel takes the series to a new level though because this could be so amazing with a bit more oomph to it and a bit fewer tropes like love triangles and kept-in-the-dark heroines... Anyways, I'm quite relieved that you liked this one overall because I've been plenty disappointed by dragon books in the past, so this is good news indeed. Very enlightening review!